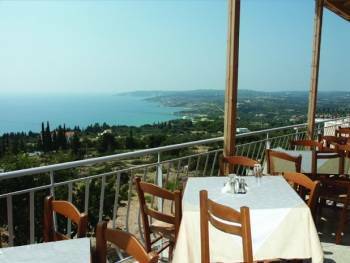 A nice restaurant with great views from the balcony and friendly service. Food was good with a wide choice on the menu. Prices were very reasonable; however it was sad to see the sheer lack of customers here despite the good value for money on offer. Overall, a nice little restaurant, with good prices which deserves more patronage. Inopolis Restaurant is located towards the far west of Lourdes on the main road. It is worth the walk along on an evening for the stunning views alone. On a hill looking out across the bay of Lourdes, this restaurant you enter off the road at the front and walk through the eloquent inside surroundings and at the back you will see everyone has ventured towards the outside mezzanine area. Get there early to get the best seat right at the edge of the large balcony for the most amazing view watching the sun set. Absolutely stunning view. However, the service could be better; we had to ask twice for a glass of water to go with a Greek coffee (which is traditionally always served with water anyway). We tried several times to catch the waitress' attention to get the bill too. The one waitress working forgot and appeared to struggle to cope on her own. The food was excellent though. I had the Becre Meze (large and tender chunks of beef in greek herb tomato sauce) was absoutely gorgeous & two of the tenderist pieces of beef - almost fillet steak standard. A generous portion too. However, being a Greek dish I requested potatoes to accompany it instead of chips but was told this was not possible. I was then offered rice instead which I accepted. Apart from that, this dish was superb. My mum had the chicken in a pot (cant remember the name) with vegetables which was very nice and tasty, if somewhat boney though. We ate at Inoplis twice during our recent holiday in Lourdas and would be very happy to recommend it. Get a seat by the window, there are excellent views. The food was good ( there is a slight Italian emphasis to the menu). the service was friendly and attentive. The house white wine was excellent and the food good value. It is quite a long way if you are staying on the beach, but well worth the walk. Possibly a bit late in the season to recommend, but I really enjoyed this restaurant. They were welcoming and friendly (remembered my drinks order after the first night ! ), the food was great (a variety of dishes, Greek and European), and they didn't mind sitting a single diner at one of their "prime", four-seater balcony tables. The prices were also extremely reasonable. I rarely eat twice at the same place as I like to see what various restaurants in the resort have to offer; I ate here for four of my seven nights ! Might have been more if I had discovered it before my third night. Have never felt inspired to contribute to a website like this but would thoroughly recommend this place. I ate here on four occasions in the week I was at Lourdas. While the food is of a high standard (and good value) , it was the view from the balcony and the warm and friendly service of the staff (especially the serving staff, Susanna & Vicky) that kept me returning. I highly recommend this establishment. First ate at Inopolis last year when we had my 80+ year old parents with us. We were made welcome and the service was excellent. We went back again this year (without parents) and the owners and the waitress remembered us from last year. We were given a 15% discount (not sure though if this was a special offer for the week we visited). Even without the discount, we found the meals very good value. This year the owners have extended the balcony which is great as most people prefer to eat outside - problem is that the restaurant always appears empty and uninviting to passersby, because the balcony is at the rear of the building. As in another post, don't be put off - you will not be disappointed. 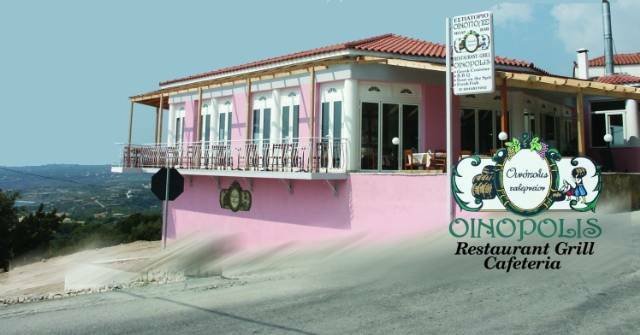 We had quite a few meals in Inopolis restaurant and they were excellant.The owners made you feel very welcome and looked after you well.The views to Peseda with the Zante ferry coming in before dark was awesome.This restaurant is at the end of the village but worth the extra walk. Had two meals here and found them both excellent. The sword fish was very tasty. Enjoyed sitting on the balacony. It is well worth the walk to the top of the village. Do not be put off by the "posh" appearance - the food and wine are very reasonably priced. The Mousaka is the cheapest in the resort. In addition it is freshly made with chunky vegetables and a very tasty bechemel sauce. Also recommended main courses are the Lamb Kleftico (cooked in paper with lots of fresh lamb) and chicken gastros (in clay pot), For appetisers try wonderful spinach pies; fried zucchini (crunchy on outside and moist inside) and both mussel dishes. Si.Ro.Ke. approved house wine is best and cheapest. Incredible views over bay to Zante from terrace. Excellent food, good service and prices. Quality house wine from owners vineyard. Recommend Spinach Pies and Calimari. Good fish dishes. Wide choice of greek food (don't like eating English dishes when in Kefalonia>.